Walk & Trip Questions: Questions about both public water walk & wade trips in Yellowstone Park and Montana and private spring creek walk & wade trips are answered here. Boat Trip Questions: Questions about river and private lake drift boat trip are answered here. You can do one of three things. You can call the shop at (406) 848-7314, you can E-mail Walter, or you can fill out our (extremely long and thorough) Guided Trip Information Request form. We finalize all bookings via phone, except occasionally in the case of clients calling from overseas. We like to finalize bookings via phone rather than relying on e-mails or web forms in order to minimize the potential for mistakes and misunderstandings. Once we have your deposit in hand, we'll mark your booking(s) on our master calendar and mail you a physical copy of your itinerary form going over the trip you've got booked and providing details on the meeting place and time, what to bring, any tackle or wading gear you've reserved, etc. Again, we want you to get a physical copy rather than an e-mail confirmation to cut down on the potential for lost information, especially since our cell phone data coverage is quite poor. Note that we typically do not charge deposits or send itinerary forms for the upcoming season prior to the turn of the year, for tax purposes. What Do You Include in Your Listed Rates? On all trips we include: the guide's time (obviously), transportation to and from the fishery starting from our shop or a prearranged meeting point, the use of rods and reels and wading gear appropriate to the season (if required), flies, leaders and tippet, other terminal tackle such as split shot and indicators, soft drinks and bottled water, and a picnic lunch on full-day trips. Rates do not include: fishing permits, access fees charged by the private Paradise Valley spring creeks or private lakes (if required), Yellowstone Park entrance fees (if required), personal raingear or other attire, polarized sunglasses (which we suggest in the strongest possible terms all clients wear; some form of eye protection is required), or guide gratuities. When we are guiding large parties, we may ask you to drive your own vehicle and meet us at our fishing spot. We will arrange this when you book. We encourage you to bring your own tackle if you have it: you will be more familiar with it and many anglers have higher-quality gear than we provide on trips (basically gear in the low-intermediate to intermediate price bracket). We also suggest you bring your own favorite flies if you have them. A few times a year, something new and weird from a client's box is just the ticket on a tough day, and our guides are always eager to see what you've got in order to generate ideas for their own fly tying, even if we only wind up using flies from our shop. Please do not ask us to bring alcoholic beverages. Montana state law prohibits us from providing these beverages. You are welcome to bring your own, however we ask that you do not drink from glass bottles in the boat (a bottle of wine at lunch is fine). It's also a good idea to drink a bottle of water after every beer and to limit your intake to a six-pack or so between two clients over the course of a day. Nothing stinks worse than being too buzzed to fish effectively when the trout suddenly start going bananas an hour before the takeout. We require 50% of guided trip fees to be paid at the time of booking, usually via Visa/Mastercard though we can also accept checks and money orders. We generally cap the deposit at $1000 even on exceptionally large bookings. Deposits will be refunded in full if you need to cancel one month or more prior to the date of the trip. Between one month and 48 hours prior to the trip, your deposit will be forfeited if you cancel, with 2/3 of the deposit going to the guide to make up for lost work. Trips cancelled with less than 48 hours notice, for any reason, will require payment in full. We encourage you to purchase trip insurance if you believe there may be a chance you need to make a last minute cancellation. The above policies are not absolute and we reserve the right to be more lenient, entirely at our discretion. If we do let clients slide on a late cancellation, this will generally take the form of willingness to apply the deposit to a trip within one calendar year of the original booking. We do not guarantee this will be possible, particularly during high season when we are usually fully booked and often have to turn away trips, making late cancellations hurt all the more. When we make reservations on your behalf on one of our area private fisheries, we will generally charge the associated access fees ($40-120/day per angler) at the same time as and in addition to our part of the deposit. Cancellation policies for these private waters vary, but since all are typically fully booked most days during high season, it is highly unlikely we will be able to get your access fee back without significant notice. What Happens if Parks' Fly Shop has to Cancel? What are the Reasons You Have to Cancel? We hate to cancel trips but we sometimes have to do so. If we have to cancel, for any reason, we will provide a full refund if it is not possible to reschedule your trip for later in your stay. The most common reason we have to cancel is if water conditions are unfishable, generally meaning the water is too muddy to run the type of trip you have scheduled. If you are flexible in regards to trip type or trip date, we can usually work around the issue. Also please note that we do not guarantee specific fisheries: if the Yellowstone is muddy but the Madison is clear and fishable, we will run your trip on the Madison, for example. The next most common reason we have to cancel is dangerous or unfishable weather conditions. We define "dangerous or unfishable" as an expectation that lightning will be so widespread or that temperatures will remain below freezing or otherwise so cold and miserable for the majority of your fishing trip that it won't be possible to complete the trip. Brief thunderstorms or steady rain without lightning are not reasons we cancel trips, nor are brief periods of below freezing temperatures or light snow showers. We may be willing to reschedule trips when the wind is expected to be horrific on both anglers and guide, but we do not cancel trips due to wind. Obviously, trips scheduled for fall, winter, and spring are expected to run in worse conditions than those taking place during the summer. Again, flexibility in regards to trip date usually allows us to work around ugly weather. Perhaps once or twice a season we are forced to cancel due to guide illness or other emergency or due to vehicle (boat or truck) breakdown. These are the worst types of circumstances because they're impossible to plan for and we often can't find another guide in time for the trip to run, since we (and most other guide services and fly shops) are usually fully booked during the core season. If something like this happens, we'll try to reschedule if at all possible, either with a different guide for the same day or later in your stay in Montana, if you have the flexibility for this to happen. If this isn't possible, we'll provide you with the use of rental tackle and a handful of flies, some pointers, and our abject apologies so you can at least get something out of the day. The least common reason we've ever cancelled a trip is because our guide forgot about the trip. We earned a terrible review on Trip Advisor for this trip and we deserved it. That guide doesn't work for us anymore because of this event and it only happened once. Can Someone Who isn't Fishing Come Along? We have no problem with one or two non-anglers coming along on walk trips to take pictures or serve as cheerleaders, though we ask that they try not to interfere with the fishing. The number of non-anglers that can come along is capped at two per guided party because even if we are not charging a fishing rate, we are still responsible for these individuals in the view of Yellowstone Park, the state of Montana, our insurance company, and other relevant authorities, so trying to keep track of more people than this starts to raise our liability to unacceptable levels. Please note that the capacity of our boats is still only two passengers and the guide, even if one passenger is just riding along. Can We Get a Reduced Rate if Only a Few People are Fishing at Once, or if a Member of Our Party Doesn't Need a Guide? To put it bluntly, no. Our rates are based on the total number of people who fish on the trip, not on the number fishing at any one time or the amount of time the guide spends with each client. We don't mind giving members of your party who aren't going on a guided trip suggestions on where to go and what to use, but if an individual walks in with the guided party and fishes the same area, they will be considered part of the guided party and the trip will be billed as such. By the same token, if we are booked for a full-day trip, we expect to be fishing with the same party members for the entire time. We will not permit the morning clients to depart at lunch and be replaced by others. This qualifies as two half-day trips rather than a full-day. The first hour or two of any trip is spent getting the guide and clients in tune with each other, so if the clients change halfway through, the guide actually works much harder than on a standard full-day trip (which after all is generally only about $100 more expensive than a half-day). We don't want to sound like hardcases here, but we have been burned time and again by groups that wound up making the guide work a whole lot harder than he was being paid for by having extra people fish. You will find that most guide services and fly shops in the region have similar policies. Are Your Trips Catch & Release Only? Except for a very few rare situations, our trips are catch and release only. There are three reasons for this: first, taking care of kept fish is a pain and takes away from fishing time. Second, almost all fish we target on our guide trips are wild, so keeping fish can severely impact populations. Finally, keeping fish in bear country is downright dangerous unless we're right next to the road. Do you want to be hiking with a slowly-rotting fish when a grizzly might get wind of it? If you catch a pure rainbow, definite rainbow/cutthroat hybrid, or brook trout in the Lamar drainage or portions of the Yellowstone drainage, or a lake trout anywhere in the Yellowstone drainage, park regulations require killing these nonnative species to protect cutthroat populations. If we are fishing near the road, you may keep the fish we kill to comply with these regulations. If we are in the backcountry, we will puncture the fish's air bladder and dispose of it in deep water, as park guidelines suggest. If a fish that is legal to keep dies or is likely to die from injuries it sustains due to the fight, you will be allowed to keep it provided we are close enough to the road that the bear danger is minimal and we can keep it cool enough that it will be safe to eat once we are able to get it in a cooler. Note that all above situations are rare. I (Walter) have been guiding since 2001 and have never had a client keep a fish, though we've killed a few rainbows since the park began requiring killing these fish in some locations. Note that we do not allow keeping a trophy fish unless the above conditions are met. Instead, we'll be sure to get a bunch of high-resolution pictures of the fish and of you holding the fish, then send you the best. A framed picture tells a story even better than a mount, at a much lower price, and it leaves the big fish in the river for our next clients to catch. What License Do I Need? Where Do I Buy It? The license you need depends on where we'll be fishing. For river float trips, power boat trips, and walk trips outside the Park, you'll need a Montana license. It's required for anglers aged 12 and up. In Yellowstone, you don't need a Montana (or Wyoming) license, but you do need a Yellowstone National Park license. All anglers are required to have a license, but for those age under 16 it's free. Licenses are not required on Depuy Spring Creek, but Montana licenses are required on the other Paradise Valley creeks. Licenses are not required on any of the private lakes we fish. Some explanation for Montana licensing: all natural waters of Montana and those human-modified waters located at least partially on public land require a license. Since Depuy Spring Creek is a man-made waterway created by diverting Armstrong Spring Creek and other small spring creeks into an old creek channel, it is considered man-made. The private lakes are all man-made reservoirs entirely contained by one private landowner. The other waters we fish are natural and/or bounded by public land. Also please note that you will need to have or be prepared to purchase your own Yellowstone National Park entrance permit for trips within the park, as our commercial permits only cover our guides, not our clients. You can purchase these at every entrance station and from the Yellowstone Forever office in Gardiner. If you are meeting your guide at Parks' Fly Shop and only part of your party is going on the fishing trip, while other members of the party will need the park entrance pass, we will need to arrange to have them drive those going fishing into the park before meeting the guide (usually we will meet at the first large pulloff inside the gate). Once inside the park entrance, the non-anglers can go on their way. Do You Offer any Discounts or Perks? We offer a variety of discounts/perks for early booking, for trips early and late in the season, and for trips involving larger groups or multiple days of guide service. Our early booking discount is simple. If you book before we update our rates for the upcoming season, you lock in the previous season's rates. This makes it a bit easier for us to book trips well in advance and gives early birds a nice potential price break. We usually aim to set our rates in late January or February, so book before that to land a deal, assuming of course that we change our rates from season to season. Early and late during our main guide season, we offer special spring and fall rates on most trips. We began offering this deal because we found our trips early and late in the year usually ran shorter than trips during the heart of the season and it didn't seem fair for us to charge full-price for trips that usually ran about 3/4 as long as our summer full-day trips. These price breaks are not available on all trips. They are described in the rates for the relevant trips. We may offer perks to large/complex groups such as corporate groups or family reunions: this may involve presentations at your lodgings, free (brief) casting instruction if required, copies of Richard's or Walter's books, shop schwag, or other perks. Is there a minimum age requirement on your trips? We do not take clients younger than eight years old. In the past we have done so, but it winds up just being miserable for everyone involved, especially the kids. Kids aged eight and up are fine, provided they are eager to learn about fly fishing. Can I request a specific guide? Can I cancel if I can't go with a certain guide? Yes you can request a guide. We ask that you begin booking your trip by contacting Walter or Richard via e-mail or by calling the shop, but you may request the guide of your choice when you confirm the booking. We will try to assign the guide you request, but make no guarantee that he will be available. Please note that when you book a trip with Parks' Fly Shop, you are booking with the shop, not with the guide. It is in fact illegal for guides in Montana to advertise their services or book trips for themselves unless they are also outfitters (guides must work under outfitters). Therefore please understand that even if you request a specific guide, we do not guarantee that this is the guide you will fish with. We will do our best to assign this guide to you, but until you actually shake his hand and start loading your gear in his truck, we make no guarantees. We do not permit late cancellations because your chosen guide becomes unavailable. Parks' Fly Shop is open year-round and we offer guided trips year-round, weather and water conditions permitting. The widest variety of available trips are available from late May through early October, but unless it's so cold we'll turn into icicles if we try to fish, we can usually put something together. The approximate available dates for each trip type, as well as rates, are discussed on the relevant page in the Guided Trips section of our website (which you're already on, since you're reading this). Yes to both questions. We are licensed on waters in Montana subject to general regulations, in Yellowstone National Park, in the Custer-Gallatin National Forest, and on the Madison River. Richard Parks is Montana Outfitter #327. Walter Wiese is Montana Outfitter #22001. Rob Olson is also an outfitter. Our guides and outfitters all have First Aid and CPR certifications, which are required to even get a guide or outfitter license in Montana and for all commercial use within Yellowstone Park. I've Never Fly Fished Before, but I Want to Learn. Do You Take Beginners? Absolutely. Probably a quarter of our clients have never held a fly rod before. Check out the Beginner Trips page in this section of the site to learn about which trips make the most sense for beginners. We provide everything you need except a license in our rates, so there's no reason for you to invest in all the accoutrements of the sport if you're just getting your feet wet, so to speak. One thing to understand is that fishing with spinning (conventional) tackle, even for trout, does not generally help learning how to fly fish. In fact, since the casting, reeling, and line handling in fly fishing are very different than those in fishing with conventional tackle, extensive experience with conventional tackle can actually make learning how to fly fish harder. In other words, those with a lot of experience with other gear but not fly tackle qualify as beginner fly anglers. My Child is "X" Years Old. Is He/She Old Enough to Go on a Guided Trip? In general, we will not take young children fishing unless a parent or other adult comes too, since we're guides rather than babysitters, while those aged 13 and up can be unaccompanied provided they're no more insane than your average teen. For what it's worth, the clients who typically learn how to fly fish the fastest are girls and young women aged 12 to 20 or so, provided they're eager. All young people learn physical tasks quickly, and young women are less likely to try to rely on brute force than young men, and are a bit more likely to listen to the guide rather than getting into a testosterone war instead, both of which help slash the learning curve. What Trips are Available for Anglers With Disabilities or Limited Mobility? Yellowstone Park and Montana are rugged places. While there are some streams in Yellowstone Park where the banks are relatively flat and the wading is relatively easy, nowhere we fish qualifies as remotely handicapped-accessible. For anyone who really does not trust their feet (or is in a wheelchair, on crutches, etc. ), we suggest float trips. We have successfully taken anglers in their 80s who had to put their wheelchair in the back of the boat. We ask our potential clients for a description of their age, general fitness level, and mobility when we take the booking, and also ask clients to disclose any phobias or other issues that might impact where we go fishing (such as a fear of animals or of heights, which as you can probably imagine are important factors in Yellowstone Park). This will help us dial in a good place to go. As noted above, for some anglers a float trip is by far the best option, but there are good walk/wade options for most anglers; we can find good places to take mountain goat 20 year-olds as well as unsteady older people who might need to lean on the guide's shoulder from time to time. We just don't want to find out five minutes beforehand that the spot we planned on will be too rough. Please be completely honest in your assessment. The single worst trip I (Walter) have ever had in my career as a guide, covering about 100 trips (or more) per season since 2001, resulted from a client who did not give us an honest assessment of his hiking ability when he booked and then refused to accept an easier-to-access location when I noticed immediately that he was struggling. Please note that our Acknowledgment of Risk and Acceptance of Responsibility Form that all clients must initial, sign, and date before going fishing with us includes a section indicating that any physical or mental limitations have been disclosed beforehand. No, but not knowing how will slash the number of places we feel comfortable taking you, because waders do fall in, clients do fall out of the boat or fall getting in and getting out, and once or twice a year some guide on the Yellowstone out of all the guide services makes a big mistake and flips a boat. With non-swimmers we'll stick to small streams and gentle rivers on walk-wade trips, and we'll float flat sections on boat trips where the guide could make a rescue without endangering the boat. Non-swimmers are required to wear life jackets at all times on float trips. For what it's worth, we added this entry in winter 2018-2019 because we had a non-swimmer fall out of the boat in a whitewater stretch in 2018. This was the first time in the guide's career that he'd ever had a client fall out of the boat. The client didn't disclose his inability to swim, he'd requested the whitewater float, and he took off his lifejacket when the guide said it was safe to do so "if you feel comfortable." Our guide (a former lifeguard) had to jump in and perform a water rescue for the first time in almost two decades... We now double check to ask everyone if they can swim. A Member of Our Party is Pregnant. What Trips are Available? Because of the risk of falls on walk & wade trips, even on gentle roadside streams, we take pregnant clients only on boat trips after the first trimester, more or less. All drift boat trips are suitable for pregnant women. Use your head, though. If a member of your party is near-term, it would be a bit of a bummer for everyone concerned for contractions to start when we're four miles from the nearest boat ramp, dependent on commercial shuttle drivers to move our vehicle (which takes hours), with no way to get off the water in a timely manner. Can You Take Anglers Who Don't Speak English? Yes, but it's not easy. We really do need at least one member of every group to speak English, so he/she can translate for us. Even so, such trips need to involve a lot of patience and acceptance of some slapstick humor and misunderstandings all around. The key problem is that fly fishing is a technical sport and it's very hard to explain the precise actions involved via pantomime. Imagine how hard it'd be to explain how to cook a complicated dish without having a language in common and you get a sense of the difficulties involved. The more fly fishing experience a client who does not speak English has, the easier on everyone it is. Folks who speak English as a second language are no problem at all, especially if they are near-fluent. In fact, many of the most-skilled anglers we've taken over the years were from Europe or Japan and spoke English as a second language. What's for Lunch? What About to Drink? We provide lunch on full-day trips, water on all trips, and soft drinks (Coke products) on all trips when it is practicable to carry them (in other words on boat and near-road walk & trips, not on hike-in trips). Typically we do picnic-style sandwich lunches on our trips, with premade sandwiches or wraps, chips, fruit, granola bars, etc. At times our guides make something more complicated (usually after going insane from eating a roast beef sandwich every day), but we virtually never cook on-stream. We figure our clients want to fish and our trips already usually last until later in the day than those of most of our competitors, so we don't want to take the time to make something complicated for lunch. If having a gourmet lunch is a key element of how much enjoyment you take from a guided trip, you should probably book with another outfitter. If you require kosher, vegetarian, gluten-free, diabetic-friendly, or other specialized meals, please let us know when you book and we should be able to accommodate. Please be very specific as to your needs and make sure we understand the details. One client mentioned "I'll eat a peanut butter and jelly sandwich." We took this to mean he didn't care what we made. In reality, he had dietary issues which meant that peanut butter was about the only lunch protein that didn't give him stomach trouble. When Does the Trip Start? How Long is It? On standard walk and wade trips and river floats, a half-day trip runs 4-6 hours total and generally includes 3-4 hours of fishing time. Half day trips meet anytime between 5:30AM and 4:00PM depending on conditions, but usually meet either between 6:00 and 9:00 or around 12:30. All Full-day trips are more flexible, but generally speaking these trips run 8-11 hours total and include 7-9 hours on the water. Walk/float combo trips run slightly longer on average. We'll meet between 5:30 and 10:00AM, depending on meeting location, travel time, weather, and the kind of fishing we'll be doing. A typical summer trip meets between 6:00 and 8:30AM. Double half-day float trips usually run slightly longer than standard full-day trips and meet at the same time. The weirdness with these trips happens in the middle. Offseason walk trips include around 2 hours of fishing time and 3 hours of the guide's time. It's cold enough you wouldn't want to spend any more time out there, trust us. We'll plan to meet around 1:00PM, so we're fishing during the warmest part of the day. We will arrange a tentative meeting place and time with you when you book, then finalize these details based on weather/water conditions and any requirements you may have when you check in a day or two before your trip. Unless you're staying in Yellowstone Park, most walk-wade trips meet at our shop in Gardiner. Many of our floats will meet somewhere between Gardiner and Livingston, Montana, since the guides we use on these floats are often based downriver and the stretch we'll float is usually located somewhere between our shop and their homes. Refunds are unavailable if you choose to end a trip early. If weather conditions become dangerous early in a trip or water conditions suddenly fall apart, rate adjustments may be possible solely at our discretion. What Kind of Trip Should I Take? Full-Day or Half-Day? Choosing between each of the five types of standard trips we run (public walk, spring creek walk, river float, lake float, walk/float combo) offer different things, produce different results at different times of year, may or may not be available at certain times of year (though all are available in the core summer and early fall season) and are suited to individuals with different skill levels and interests. The best way to decide which type of trip to take if you're unsure is to call us or e-mail us and talk it over. The descriptions of each trip type given on each type's own page in this section of the website will often give you a ballpark idea. Full-day trips are far more popular than half-day trips except for beginner clients. Most of the time we suggest half-day trips for beginners and children aged 8-12, while full-days are better for others. On full-day trips we have more time to reach distant destinations, can hike farther, cover more water, see the whole day's succession of hatches and the like, and all in all have a much richer experience. Half-day floats do have one benefit: it is usually easier to get away from other boats on half-days than full-days. Except for beginners and families with children, cost is usually the determining factor in whether clients book full or half-day trips. Please note that not all trips are available as half-days, in particular lake trips, spring creek trips, and float trips on rivers other than the Yellowstone. How is the Cell Service on the Trip? I Have My Own Tackle. What Sorts of Tackle and Flies Should I Bring? Check out our Fishing Info Site for an immense amount of detail to this question. We'll give a shorter and more specific answer relevant to the specific trip you book and time of year you're coming when you book, and can also offer tips on what to have for fishing on your own. Definitely check out the Fishing Info Site, though. It's basically an online guidebook. I Don't Have Tackle, or I Won't be Bringing It. Do You Offer Rentals? The use of a fly rod and reel as well as wading gear appropriate to the season is included on all of our trips, if you don't have your own. In addition our guides will usually carry at least one spare rod on all trips save Beginner Brookie trips. The shop also rents fly tackle and wading gear, if you're going to be fishing on your own. All gear is first-come, first-served and is subject to our needs for guided trips. There are some July and August days when we will have very little gear available. Do You Allow Spin-Fishing (Fishing with Conventional Tackle) on Your Trips? We allow spin-fishing only on float trips. This is basically a matter of what our guides know how to do. None of us fish with conventional tackle, so having you use it on walk/wade trips doesn't make a great deal of sense since these trips are all about the guide's fishery-specific knowledge. In addition, many walk/wade fisheries are either unsuitable to conventional gear (either too rough or home to fish that are too spooky) or are subject to fly-fishing-only regulations. On boat trips, where boat positioning is a much more important factor and the fish are more aggressive, spin anglers can sometimes do quite well even though our guides are not well-versed in it. Spinning rods may or may not be available for client use on boat trips. We have some reasonably-priced spin tackle available for sale. Spinning lures are not included in the trip pricing, but we have a reasonable selection in the fly shop. We can bring along a selection of lures and only charge you for what you use. We can also offer general suggestions on suitable tackle and lures you should bring (if you have your own) when you book. Please note that we do not permit natural bait (worms, minnows, salmon eggs, grasshoppers), artificial bait (Power Bait), or soft plastics on any of our trips (note also that all of the above are illegal in Yellowstone Park). We will also remove a hook point from any treble hooks used and require all hooks to be barbless, in both cases to avoid ripping up the fish more than necessary. We will carry pliers suitable for clipping hook points and flattening barbs on any spin-fishing trip. It is entirely reasonable for a spin angler to fish with fly angler on the same trip. Usually we'll put the fly angler in the front of the boat and the spin angler in back. How Cold is the Water? Do I Need Waders? Water temperatures range from thirty-five degrees into the high sixties. We generally wear waders all the time until early June and again from late September onward. Some waters require waders year-round, chief among them the upper Yellowstone River, and if cold/wet weather is forecast we'll wear waders even in high summer. Otherwise, we wet-wade with our wading shoes and gravel guards whenever weather permits, since this is cooler and more comfortable and requires less gear to be carried. It's always a good idea to bring waders in case of a cold snap, but you're probably safe if you choose not to from late June until mid-August unless you're planning to fish the upper Yellowstone near Yellowstone Lake or the lake itself, both of which are icy year-round. Wading in an old pair of tennis shoes is usually not a good idea except on meadow streams or on float trips where we'll only be getting out of the boat for lunch and to visit the bushes to answer a call of nature, since our waters are often in rugged terrain and have fast currents or otherwise make soles designed for wading and good ankle support necessities. We likewise do not suggest "water socks" of any kind, including those intended for whitewater rafting; dedicated angling wading shoes or boots are far better. Felt soles are now illegal in Yellowstone Park, though they are legal in Montana. For practical purposes, we suggest sticky rubber-soled wading boots for all waters, since it's much easier to carry one pair of wading boots than two or more. If your boots have metal studs, soft aluminum studs or bars are better than hard tungsten-carbide spikes on our local rocks. Please note that you will need to remove any metal, whether studs, bars, or cleats, from your boots prior to any boat trip, since sharp metal of any kind and the fiberglass or plastic hulls of our boats and rafts make an absolutely horrendous combination. Rental wading gear appropriate to the season is included on our trips, free of charge, if needed, and we have gear available to rent for days you're not fishing with us, subject to guided trip needs. For most high-summer trips, you will not need wading gear on most boat trips so long as you are prepared to get your shoes wet getting in and out of the boat. Check out the Clothing page on our How To Site for suggestions according to the season. We always suggest wearing long sleeves rather than short sleeves. In particular pants are a far better choice than shorts. We have a lot of biting bugs, prickly plants, rocks, and so on, not to mention bright sun, so keeping everything covered by a layer of fabric helps keep you from getting torn up. Our guides' standard summer uniforms regardless of trip type are lightweight quick-dry outdoor pants and longsleeve poly tee shirts with SPF, a synthetic neck gaiter (Buff), and a hat and polarized sunglasses. It's a good idea to follow our lead. What Clothing/Gear MUST I Bring? You MUST bring polarized sunglasses or be prepared to purchase them from our shop (fitover or clip-on glasses that fit over prescription eyeglasses are fine). Not only do polarized sunglasses improve your ability to see/recognize strikes by several orders of magnitude, they also provide eye protection from hooks in case of an errant cast. If you absolutely do not want to wear polarized glasses, we won't insist, but we require all clients to wear some form of eye protection on all trips, no exceptions. This is a safety measure; we don't want a client to lose an eye due to an errant cast. Even cheap polarized glasses are an immense improvement over no glasses at all or non-polarized glasses; $15 glasses are fine. We also strongly suggest you bring a hat, either a ball cap or a broad-brimmed hat. Hats cut down on sunburn and eye strain, help protect your face from bad casts, and cut down on glare, making it easier to see strikes. We also strongly suggest bringing a raincoat, no matter how pleasant the weather is when you start your trip. It can go from 80 degrees and sunny to 45 degrees and raining in half an hour around here, especially in August and early September when fall first starts poking at summer with a sharp stick. Hypothermia is actually a bigger problem in the summer than the winter, since in the winter people are usually prepared for bad weather. We have emergency ponchos for sale in the shop, and our guides generally carry spares in their boats, but on hike-in trips you will need to have your own. On walk/wade trips, make sure to bring a fishing bag or vest or a lightweight backpack to carry water (either your own reusable bottles or bottles we provide), your raincoat, etc. On trips that involve hiking, you will want a larger daypack; we will tell you to bring such a pack when we finalize the trip. Otherwise, required medications, spare socks for the end of the day, and other commonsense items are all you need to bring. We provide any fishing tackle you don't have free of charge. Where Will We Fish? How Long a Walk Is It? Are the Banks Rough/Slippery? Both questions depend on your experience level, interests, the season, etc. On our walk trips we fish anywhere from right alongside the road to five miles into the backcountry, in flat meadows where we've taken 85 year-olds to rugged canyons that seem to require as much rock climbing as walking. Our How To site and the information on the Walk & Wade Trips page will give you a good idea of how the season affects where we fish. This should give you some idea of our options. We do have some secret spots where we might take you, of course, but they're too sensitive to mention online. Beginner Brookie trips usually take place on the upper Gardner River, one of its tributaries, or on a couple tributaries of the Yellowstone, all within Yellowstone Park. The walk required ranges from half a mile to over two miles one-way, with longer walks generally required the later into the season we go. Some rough footing and steep trails are present on portions of the Gardner, while the other locations have fairly flat terrain but often some deadfall trees and boulders to negotiate. As for the private spring creeks, Depuy, Nelson, and Armstrong Spring Creeks all offer different things, with Depuy featuring the widest variety of water. This makes it our favorite of the creeks and the one most-suited to anglers of intermediate skill. All three creeks feature exceptionally easy access, with gravel roads, clear angler paths, benches, picnic tables, and so on limiting the need to walk very far at any one time or over rough ground. Does Hiking a Long Way Reduce the Amount of Fishing Time? It sometimes does, though the hike is usually worth it in terms of solitude, larger and/or more plentiful fish, and scenery. We may stay out a bit later on days when we hike a long way, but there are only so many hours of daylight, meaning that a hike to the Second Meadow of Slough Creek or several miles up the Black Canyon of the Yellowstone will by necessity eat an hour or two of fishing time. What Kind of Shape Do I Need to be in to Take a Walk Trip? The baseline requirement is an ability to stay on your feet for most of the day. We will either travel to a picnic area or find a convenient spot under the trees to eat lunch, but otherwise there aren't many places to rest on the public water we fish. The spring creeks have numerous benches, picnic tables, etc. Other than this, physical fitness is not a huge requirement, as there are streams to suit any degree of fitness or desire for adventure. That said, the longer and/or more-difficult a hike you are willing/able to make, the better the fishing usually is. It's always better to find fish that aren't overpressured, and the best way of finding such fish is to get away from the places that are easy for anglers to access. I Want to Catch Big Fish in a Place Where I Won't See Anyone Else. Is This Possible? Sometimes. Despite popular opinion, there are still secret spots in the Yellowstone area. In general, big fish and no other anglers does require one or more of the following: fishing first thing in the morning in early fall, fishing in the true offseason (late fall, winter, or early spring), hiking a long way, and fishing a steep/rugged/turbulent/slightly dangerous stretch of water. What are the Maximum Distances You'll Hike on a Walk Trip? Generally speaking, five miles one-way is the absolute maximum we're willing to walk. Any more and we're too tired to fish once we get where we're going, and it's too late in the day by the time we get there. Two or three miles each way is more common when we want to shed the roadside crowds for some solitude. Even a short hike, less than a mile, is often enough to shed all competition, particularly if the hike is steep and/or rugged. Most flat roadside streams will be crowded, even if they're not very good. How Crowded Will It Be, or, "I Want to Fish a Meadow Stream Close to the Road Where the Trout are Large and There aren't Any Other Anglers, and I don't Want to Pay for a Private Spring Creek Trip. Is This Possible?" This was a real question (a demand in fact). We told this client that if he found such a place, he should tell us so that we could go there, but otherwise keep it under his hat. There's a three-part equation to how crowded a piece of water can be expected to be: the closer to the road it is, the easier the walking/wading along the stream, and the larger the fish are, the more crowded it will be. Usually two out of three will get you onto relatively uncrowded water. So a long hike with easy wading with big fish usually isn't too crowded, nor is a short hike to a stream with big fish but really rugged wading. Small-fish water a mile or more off the road is generally empty, especially if the going gets rough in spots. Gentle streams that flow beside the road and hold big fish are always crowded, unless they're private. Only Two Clients are Permitted Per Boat. Why? The above photo is from a Clacka Craft 16LP drift boat, the model of boat used by a majority of our guides. 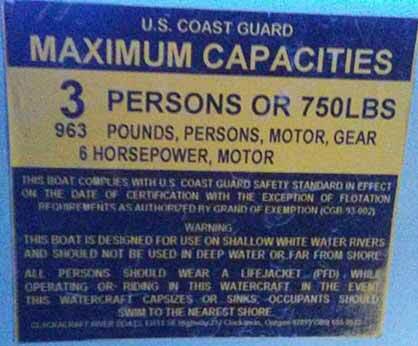 Two clients and a guide are therefore the boat's maximum legal capacity. Some of our guides use boats with higher capacities, but even these boats only have seating for two anglers and the guide, making it unsafe to float any rough water at all with more than two aboard. Moreover, our boats feature only two casting braces, one in front and one in back, so only two people can fish, anyway. In sum, more than two passengers requires more than one guide. What the Heck is a "Double Half-Day" Trip? Why do they cost more than a full-day float? A double half-day float consists of floating two separate short sections of river, one in the morning and one after lunch, rather than one long stretch. There are a couple reasons we offer these trips. First and foremost is the ability to show our clients two different stretches of river in one day of fishing. The Yellowstone changes dramatically over the 90 miles or so of it that we float, with some stretches holding large numbers of medium-sized trout that love dry flies and others holding smaller numbers of big fish. The scenery, character of the water, and even the weather can change depending on where we go. While we'd love it if clients were up for booking two (or more) full days with us to see different stretches of river, the double half-day allows us to see a lot of river in one day. Ideally, we'll have our cake and eat it too: catch numbers of smaller fish on dries during one half of the day, then get some big daddies in the other half. The other reason we run these trips is to provide flexibility: flexibility to beat crowds, outrun dirty water due to rain storms, or just to fish one specific short stretch of river twice in one day if it happens to be fishing particularly well. How come these trips cost more? Two reasons. First and foremost, they cost us more. On double half-days we pay our shuttle service for two river shuttles (currently costing us $25-$40 per shuttle) rather than just one. We also have to pay two sets of commercial use fees if we utilize National Forest boat launches (currently around $13 per client per launch, over $50 if we double up on National Forest water during the course of the day). Secondly, these trips run long due to the time needed to launch and secure the boat twice, rather than once, so they always take more of our guides' time than standard full-day trips. We're paying our guides a few bucks extra due to this fact. For river trips, we primarily float the Yellowstone River between the first boat launch downstream from Gardiner two miles from our shop down to Big Timber, about 90 miles away. We also run trips on the lower Madison River, the Boulder River, portions of the Jefferson River, and portions of the Missouri River. The Yellowstone in particular can fish very differently depending on which stretch we're doing. In general, we float further up the river for numbers and dry fly fishing and further down for a shot at big fish. There are exceptions to this rule, but it's a good way of thinking about it. The Middle and Lower Yellowstone River sections of the Yellowstone River page in our How To site will give you an idea of which stretch is right for you. While the Yellowstone is a good choice for all anglers, when it's clear from the spring melt, the other rivers we float are available for shorter chunks of the year and are often "niche" fisheries suitable only for certain anglers. For more details on when, where, why, and with whom we float them, please check the relevant tab on the River Floats page. On lake trips, you can choose which lake to fish. The Lake Floats page has a great deal of information on each lake, and you can also ask us for our recommendations. The only thing we'll say with certainty is that if you want a good chance of catching fish on dries, you should fish Burns Lake. The lakes are the best float trip choices for novice anglers and those who want to be almost sure of catching larger fish, albeit maybe lower numbers of them. Please note that the lakes are only good choices early and late in the season, as all grow too warm for optimal fishing sometime between June 15 and July 15 and remain too warm until sometime between September 1 and September 15, depending on weather conditions and the specific lake involved. What Species Will We Catch? How Big Will They Be? It depends on how lucky you are, how skilled you are, how well the fish are biting, the time of year, and the body of water in question. Please visit the relevant section of the River Floats or Lake Floats page for more details. What Kinds of Boats do You Use? We utilize both drift boats and rafts. Some guides have one or the other, some guides use both. In general, the higher and/or rougher the water, and the more obstructions (rocks) there are, the more likely we'll use a raft. In gentler sections of river, we'll almost certainly use a drift boat, since they're easier to fish from and have more room. If you have any mobiility issues, we need to know about these, since getting in and out of a raft with its wide tubes is harder than getting in and out of a drift boat with narrow sides. Do You Encounter Much Whitewater on Your Floats? All sections of the Yellowstone feature at least a couple small rapids. The only extended whitewater is found on the upper river between Gardiner and Corwin Springs and in Yankee Jim Canyon. We may require you to wear life jackets for portions of these sections, or on other sections early in the season when all rapids are heavier. The Yellowstone isn't a really heavy whitewater river. Except in a few rapids, you don't even need to stop fishing as we run the waves. We tend to cut things pretty close to keep you fishing the prime water, so we may splash a little water over the sides at times, so it's a good idea to be prepared for this eventuality by stashing phones, etc. before we get started. There isn't any whitewater on the sections of the Madison and Jefferson we run, and it's rare on the Missouri. The Boulder River is a fast-flowing, whitewater river in general. If you would rather not fish a rough section of river, for whatever reason, please please please tell us this when you book. If you would really prefer not to get wet or have your heart beat faster, we have to know this before we launch. We can pick a gentle section of river as long as we know ahead of time. Richard Parks is Montana Outfitter #327. Under his licensure, Parks' Fly Shop is licensed to operate in Yellowstone National Park, Montana waters under general regulations, and the Custer-Gallatin National Forest. Walter J. Wiese is Montana Outfitter #22001. Under his licensure, the shop is licensed to operate on the Madison and Missouri Rivers. Text, graphics, and logos copyright Parks' Fly Shop. Photos copyright Walter J. Wiese or the photographer. If you would like to use any of the content on this site for noncommercial purposes, you are welcome to do so provided you include this copyright notice and our contact information. Please do not use the information here for commercial purposes without written permission.